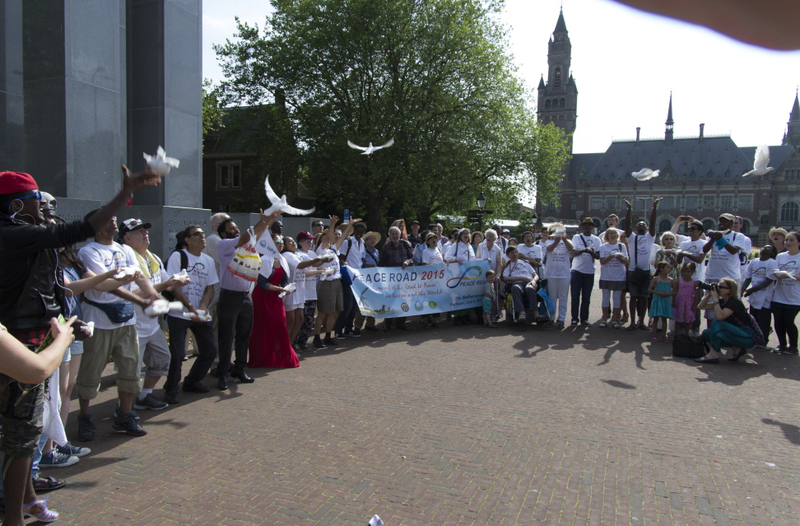 FFWPU Netherlands, By Hans Campman, The Hague, The Netherlands: In Saturday, July 4, 2015 a “Great March for Peace” was held in The Hague, the seat of government in the Netherlands, and the capital city of the province of South Holland, the third-largest city of the Netherlands, after Amsterdam and Rotterdam, and internationally celebrated as “city of Peace and Justice”. 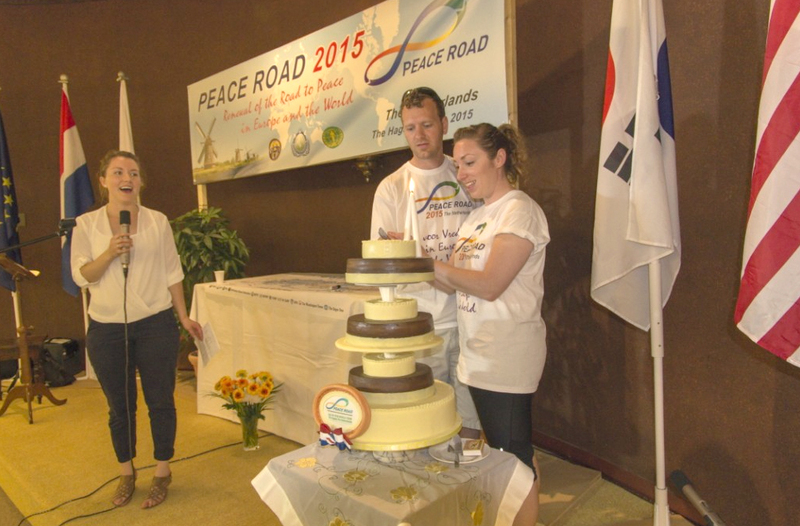 There were 106 participants in “Peace Road 2015 The Netherlands, July 4”, which had the slogan “Renewal of the Road to Peace in Europe and the World”. The initial meeting place and center of operations was the Sufi center in Anna Paulownastraat, close by the Peace Palace. It was reported that more or less half of the participants were Unificationists, the rest good friends of the Unification Movement. There was a balanced participation of people from all layers of the society, and three generations were equally represented. 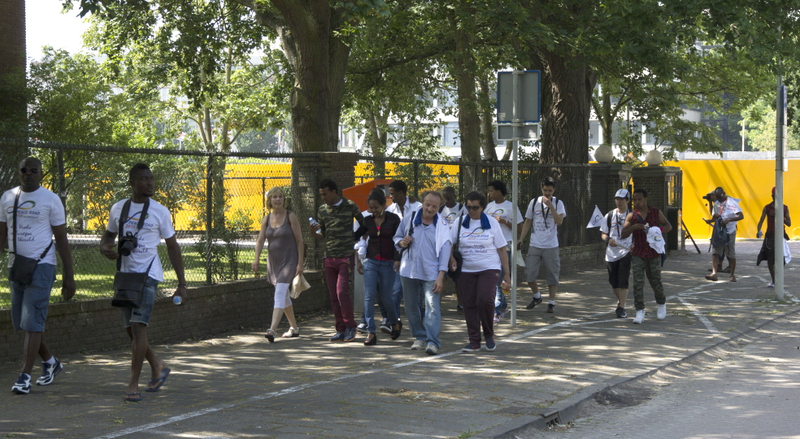 The peace march took place in hot weather, which is not common in the Netherlands. At the end, participants were really joyful, filled with a sense of victory and unity of heart, having overcome a challenge together. The day started at 11:30 with Registration and Reception including coffee and tea, followed by a “Kick Off “meeting, preparing for the peace march, with “several speakers to explain the initiative” and some individual songs, followed by a prayer. After a light lunch, the main event began, a 10 km. walk passing 24 international and national important institutions and monuments; some took a shorter five km. route. 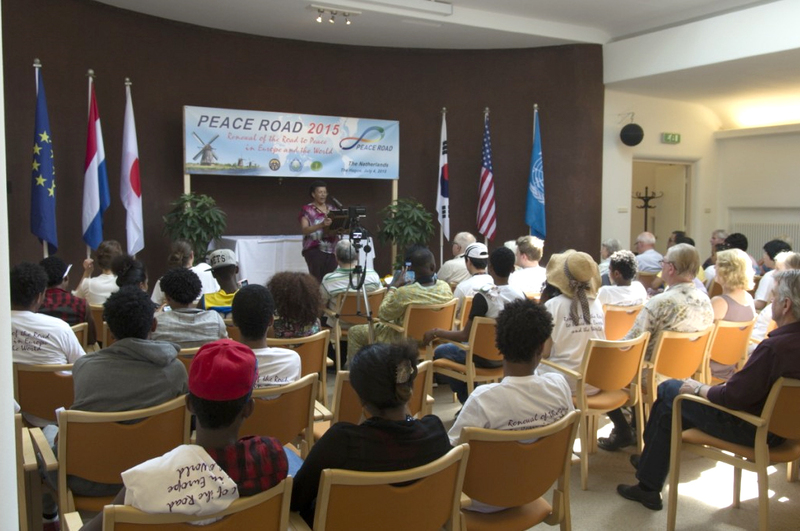 In addition to a tee shirt, everyone received a “Peace Tour 2015” badge and certificate of accomplishment. 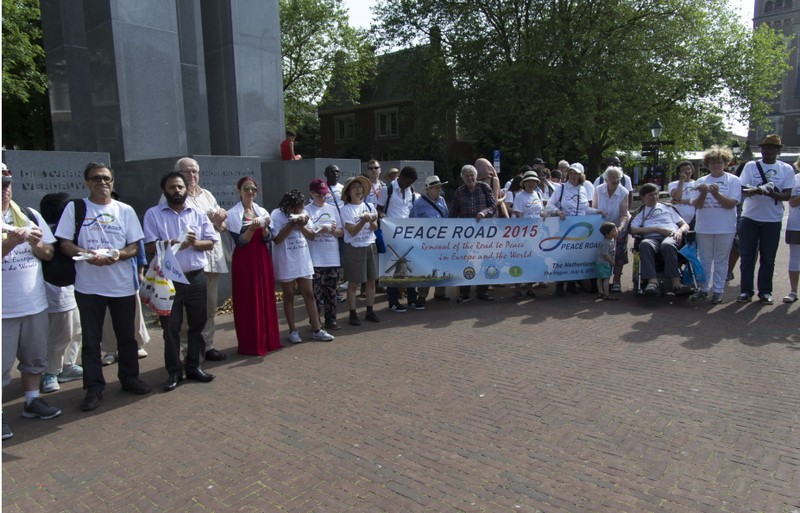 During the walk, Universal Peace Federation Nederland Secretary General Wim Koetsier conducted a number of interviews, which were filmed and will soon be distributed, together with videos and photos of the whole day’s activities. 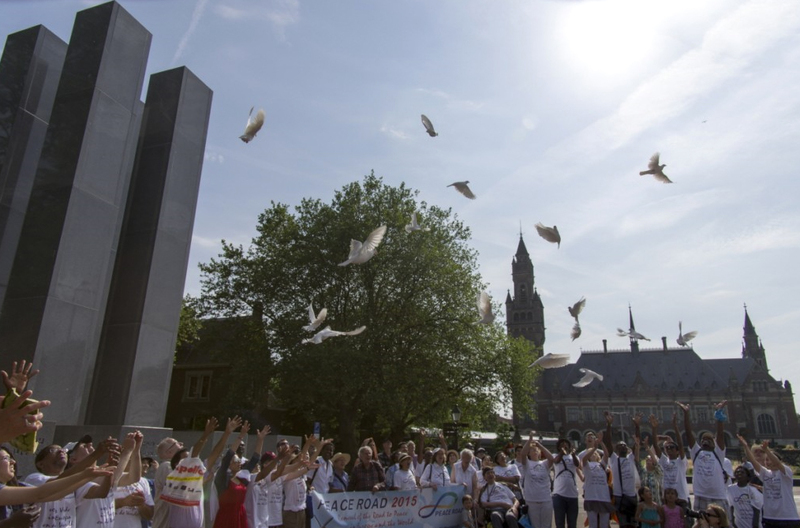 At 17:00, after the completion of the march, everyone met outside the Peace Palace, sang “Let there be peace on earth and let it begin with me” and released 21 doves, white homing pigeons. This was followed by a closing session and festive meal, prepared by Rudi & Thea Rijntjes, in and around the Sufi Center. 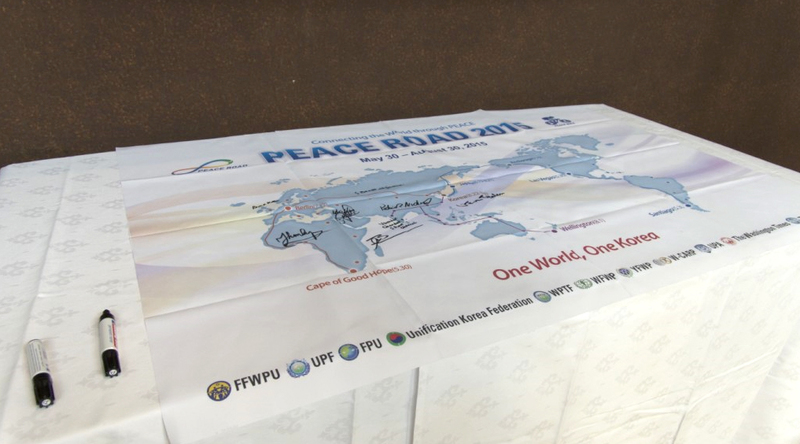 At the midday “Kick Off” meeting, MC Sophie Janssen welcomed all participants and introduced Family Federation for World Peace and Unification (FFWPU) Netherlands President Hans Campman who gave a “Vision explanation” of Peace Road 2015. 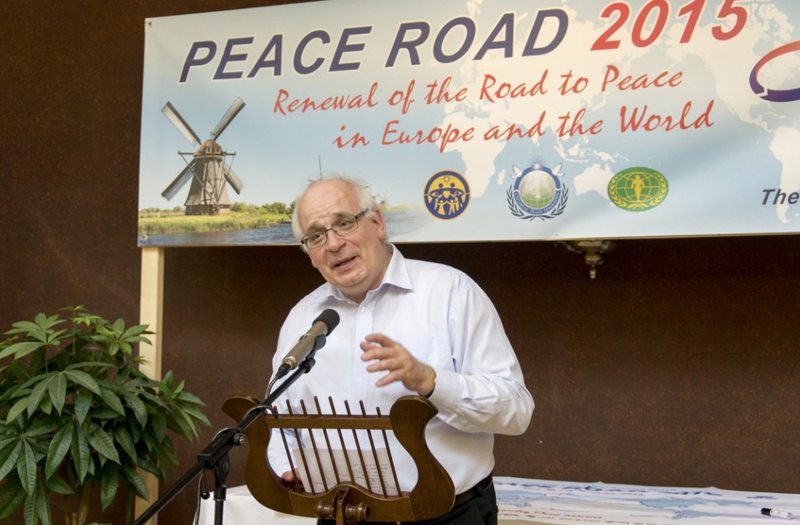 He was followed by a number of speakers, of whom four were UPF Ambassadors for Peace, and included Dutch elder statesman and member of the Netherlands Advisory Commission on European Integration, Dr. Wim van Eekelen, who spoke warmly about the activities of the Universal Peace Federation, mentioning in particular the “Mixing of Water” ceremony symbolizing the unity of religions. He was followed by Bart ten Broek of United Religions Initiative; Varandar Chandar of the Sri Ramanuja Mission Trust; Leonard Kater, representing the World Federalist Movement and Centrum Emma, a gathering place for peace activists with a Unesco Library; and Alaeddine Touhami, representing AISA (Alawiyya International Sufi Association), which promotes a culture of peace by stimulating intercultural co-operation, brotherhood and mutual understanding between spiritual movements. Singers included Eleanor Flowers Klerkx, who sang a hymn and a spiritual, and Christopher Vipond Davies, who congratulated all the participants in choosing to do something good and sang his version of the famous British poem and song “I vow to the my country”, with an extra verse about Cheon Il Guk. 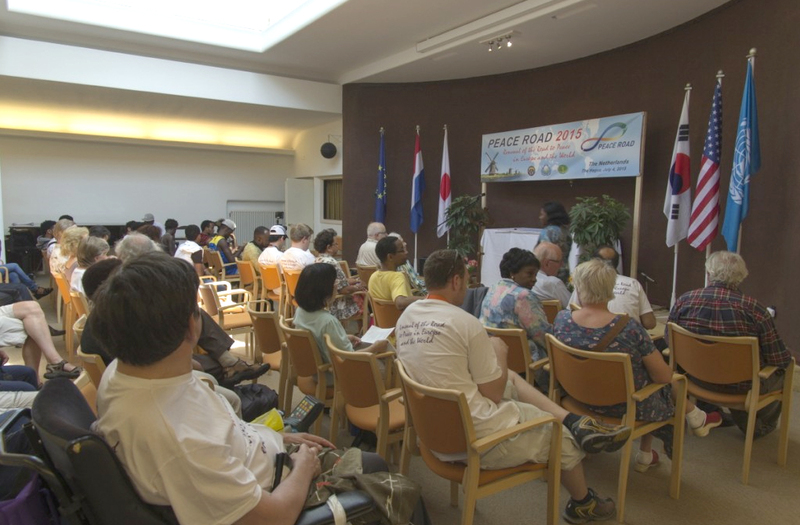 Finally, there was a “practical explanation” of this Peace Road Tour by Stephan van Winden, including his classification into groups with group leaders. The prayer was made by UPF-NL Ambassador for Peace Georgine Wijsman-Bendt, a pastoral worker with the Moravian Brother Community, who was so moved by the event that she said that she would ask her children to put the Peace Road t-shirt Stephan van Winden gave her because of her beautiful prayer on her coffin, visible to all those in attendance. At the beginning of the post walk closing session, Grace van Dorsten sang a number of her original songs. Everyone had the chance to sign the banner and Eleanor Flowers Klerkx led everyone in singing “We are the world”; after which the celebration cake by Donna Martin was cut and everyone joined in three cheers of Og Mansei.